SleepScore Max Sees You When You're Sleeping and Offers Helpful Tips to Improve Your Snoozing! Sleep Is a precious commodity that’s taken for granted. It’s important, but it is far too easy to let it slide in favor of binging Netflix or stalking old high school classmates on Facebook. I’ve tried wrist based sleep devices in the past, but I tend to forget to check it or use the information it provides. 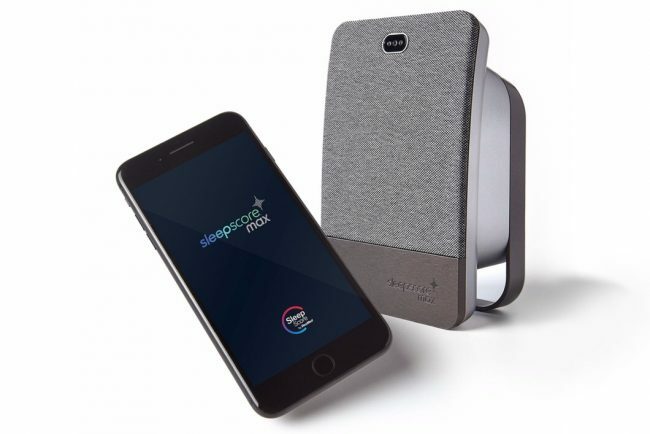 SleepScore Max aims to change that with their one-two punch of an easy to use nightstand device and a full-featured and very helpful app! The device itself is very nondescript. It plugs in via USB-C to a wall plug, and connects via Bluetooth to your phone for the companion app. There is very little decoration anywhere on the device, and there’s an LED on the top that glows green when a phone is connected and red when it isn’t connected properly. It’s a pleasant but bland gray, and it looks like it should be a speaker but isn’t. It has a small footprint (I’d say about half the size of a mass market paperback in terms of depth, and about the size of the same paperback in terms of height), so it’s easy to set it up once and forget it (mostly — more on that below). The app does all the heavy lifting but the device is what gathers the data, and it does so in a clean and unobtrusive manner. SleepScore’s app is the true brains of this operation. When you set it up, you’re asked a lot of questions about your sleep habits, and every night it polls you about your day to better compare your sleep to how your day has gone. It asks how much caffeine you had, how much you exercised, whether you consumed alcohol, and how high your stress level is. All that is important because the app is truly analyzing your sleep every night, and it can use this data to better determine if your sleep was impacted by any of these factors. In addition, there are tips on how to improve your sleep, as well as explanations on how to read the various graphs and results of your sleep monitoring. The app/device also tracks the temperature and brightness level of the room for further data on the room where you are sleeping. I’ve found the SleepScore to be pretty excellent at picking up my sleep patterns. There’s a feature to use an alarm that goes off within 15 minutes of a set sleep time, ideally so it can wake you when you are most receptive to it, and it seems to work well for me. To be fair, it’s followed immediately by 6 more alarms from my phone because I’m one of those people, but it does help me up! In addition, I really like that the app provides analysis the next day of how you slept and what that means. 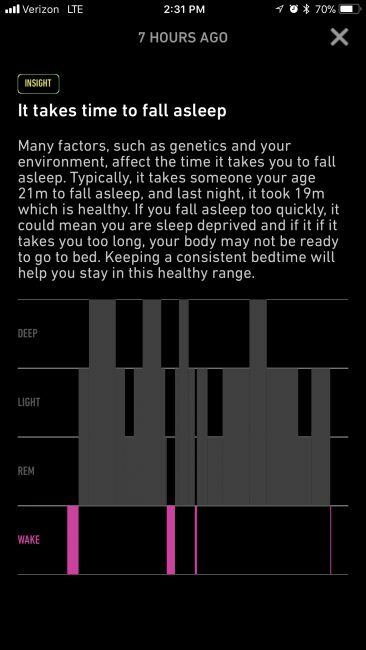 For example, it tells you how long it took from when you asked it to start tracking to when it sensed you fell asleep, plus it explains what the average time is for someone your age AND what it could mean if you’re outside the norm. The same goes for how many times it sensed you wake up at night, how long you were in REM sleep, etc. 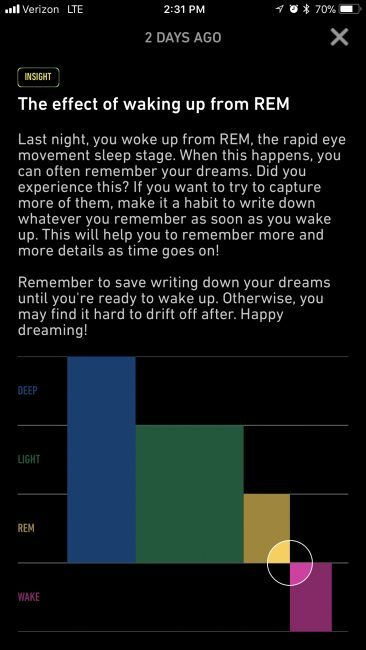 It’s fun to read about, plus if you track what you were doing on certain nights it can help you develop better patterns. For example, I am trying to make a serious effort to spend 15 minutes reading a paper book before bed instead of an ebook, and I’ve noticed my time from sleep tracking to falling asleep dropped significantly when I did that. If I had to nitpick, the biggest issue I have with the SleepScore is the scoring itself. I like having everything quantified, but the nerd in me gets sad if I don’t get a passing grade on sleeping. I get that the “scoring” is right in the name, but I found the number value to be the least useful part-for me, I like knowing what the numbers mean and how they can be improved more. Also, the instructions were adamant that you use SleepScore’s power adapter, which created a minor issue for me. Power sockets are at a premium where I sleep so I had a few times where I forgot to plug the SleepScore back in after using the plug for something else. That’s also where the “tell SleepScore Max about your day” prompt came in quite handy, since it reminded me to swap around the plugs again! At $149, it’s not cheap, but if it helps you sleep better than the extra productivity and overall health makes it worthwhile. Overall, I really liked the SleepScore Max device. It is far less intrusive than a wrist-based system, and doesn’t require you to have a specific kind of mattress like some of the other systems. The app also educated me a great deal about not just the quantity of sleep I was getting, but the quality as well, and it’s allowed me to make adjustments to improve those numbers further. We have a lot of ways to quantify and analyze our lives and our sleep, and SleepScore Max makes it very, very easy!